2credit: Break up to 3 code gate subroutines. 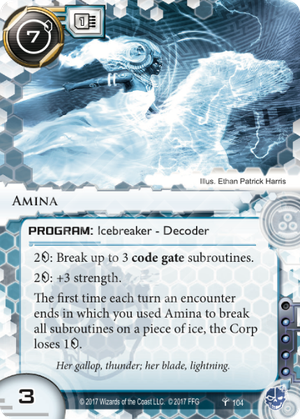 The first time each turn an encounter ends in which you used Amina to break all subroutines on a piece of ice, the Corp loses 1credit. FFG rarely prints strict upgrades to previously-printed cards but that's what Amina feels like to the now-rotated Leviathan. We can compare the new icebreaker to the 2 main Criminal decoders right now: Abagnale and Passport, which both have the exact same paid abilities (excluding Abagnale’s trash-can). DISCLAIMER: I won’t be comparing her to out-of-faction decoders, specifically Shaper. This is because I see Amina staying in blue decks only, due to its big 4 influence. Sorry Anarchs, you’re stuck with Black Orchestra until Cradle comes out. Amina’s ability may as well read 2 to break all subroutines since the only code gates I could find with 4+ subs naturally were Fairchild and Macrophage (exc. Loki), both of which aren’t that pervasive in the current meta. And with so many big bullies at 3 subs (DNA Tracker, Fairchild 3.0, Mausolus), you’ll be glad to pay a less every time. So let’s get to the elephant-in-the-room: Amina’s big 7 install cost. A vanilla install of this will almost always lead to a huge tempo swing so cheating her out with cards like Credit Kiting or Retrieval Run are highly recommended. Ideally, you also want to see her early so that you can get the most out of the card’s econ-drain ability. Amina is not for every Criminal player but with econ denial being pushed as the main blue archetype, I think she’ll find a comfortable home in many upcoming decks. Besides, who wouldn’t want to break FC3, DNA Tracker, or Mausolus for 4?